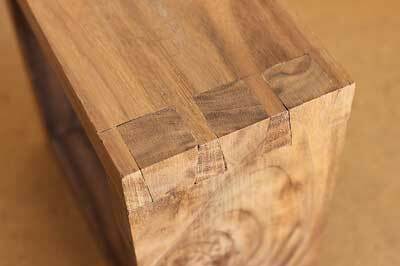 Dovetailers have diverse opinions about cutting dovetails by hand, the most controversial of which is, of course, tails first or pins first! 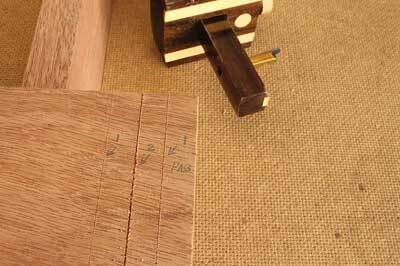 Though seldom argued, woodworkers also differ in how they gauge the baselines in their dovetail work. 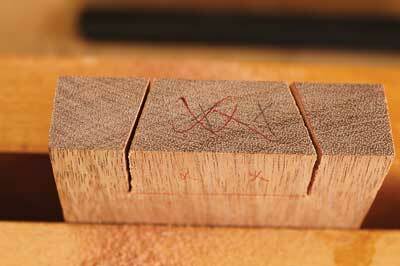 Here, we'll examine three different ways a marking gauge can be set to scribe the baselines. In the sidebar on marking gauges you'll learn about different types of marking gauges as well as tips on how to gauge properly, as accurate gauging is a basic but critical skill for fine work. 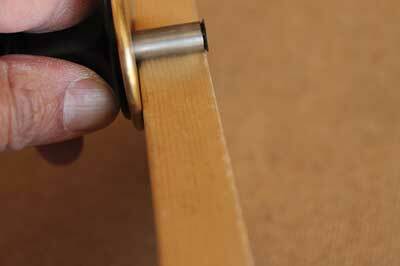 If a marking gauge is set greater than the thickness of the wood, the tails and pins will protrude beyond the surfaces when cut and assembled. 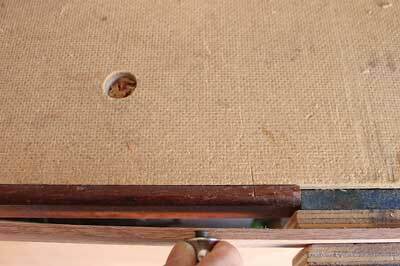 Tage Frid felt that there was less work in sanding off the excess than sanding or planing down the whole side. American furniture designer and writer Sandor Nagyszalanczy is a user of this approach. He recommends starting with stock that is oversize so the gauge can be set about 0.8mm wider than its thickness, "making it easier to sand or plane the joint surfaces flat after assembly, for a nice, clean final look." 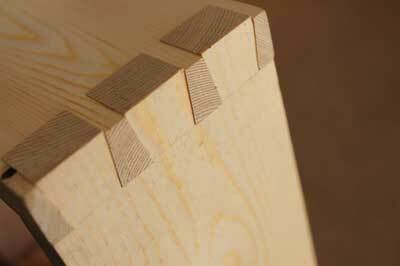 Levelling the dovetails can be done with a low-angle plane from the front of the joint towards the end or with a chisel using slicing cuts from both ends. 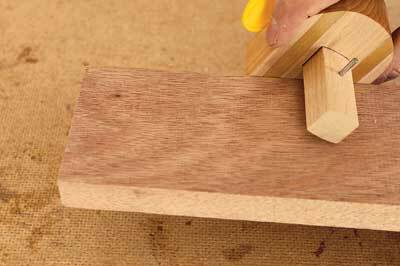 Because the ends of the joints stick out above the surface, usually clamping blocks are used to ensure a good glue-up. Setting the marking gauge to the thickness of the wood is perhaps the commonest practice among woodworkers, including Frank Klausz, Thomas MacDonald - host of TV series Rough Cut -- Working with Tommy Mac - and Paul Sellers who uses a knife as the layout tool. Workpieces are prepared to their final dimensions and the ends of the joints will be flush with the boards if the cuts are executed well. After assembly, you can easily clean all the surfaces with a plane and the ends and surfaces are relatively flush. Like the first method with proud ends, when trimming the ends or cleaning up the surfaces, you have altered the reference side as well as the size of the assembly. 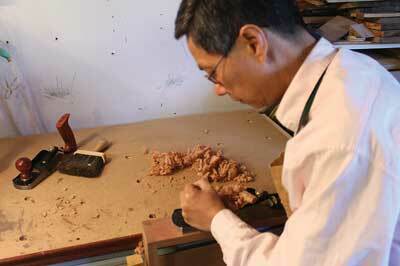 Woodworkers who set their gauges shy of the thickness of the wood seem to be in the minority. Ian Kirby, trained in the British Arts & Crafts tradition, is one of those who advise cutting the ends slightly below the surfaces of a workpiece. Why? 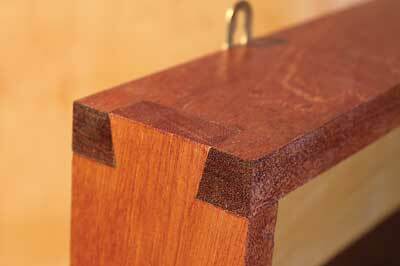 In his book on dovetails, Kirby lists several advantages of this method. For instance, if the joints are shy from the surfaces, the end grain of the joints will remain as the reference surface after removing the machine marks and layout lines, helping to keep the same thickness for the workpiece. Another benefit is that without any protruding joints, you can glue-up and clamp the assembly without using clamping aids. 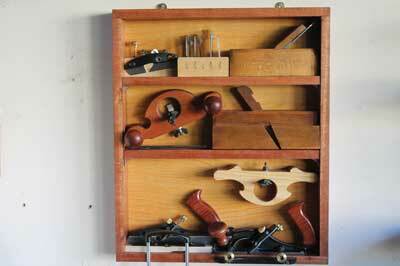 I built a speciality plane rack using Ian's approach. 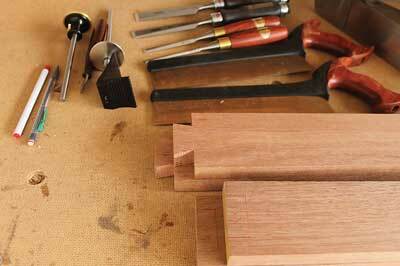 I started with the gauge set less than the thickness of the stock. After laying out the tails at a 1:8 ratio for hardwood, I finished cutting out all the tail boards. I carefully marked the pins and cut them out. 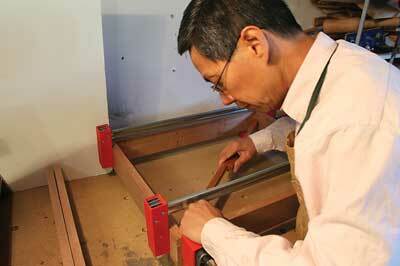 Since the ends sat below the surfaces, the clamping task was straightforward. To prepare the frame for finishing, I planed all surfaces and stopped as soon as the surfaces were planed flush with the ends. I put a few coats of boiled linseed oil and then paste wax before attaching the backboard to the rack. A marking gauge cuts with a wheel disc, a knife/blade, or a pin in pull or push strokes, depending on the type of cutter. Wheel cutters handle both along and across the grain cuts well. Knives are best for scribing crisp lines across grain and in pull strokes only while pins or spurs are used for laying out lines with the grain. In general, hold the tool with a light grip and keep the fence tight against the wood as you push or pull to mark. 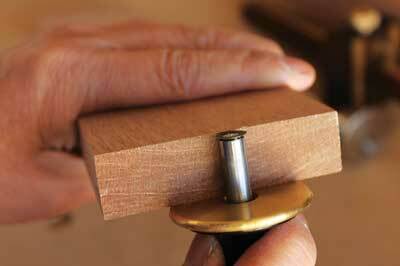 Holding a pin gauge with its pin perpendicular to the surface will cause chatter and jagged lines as you cut. Tilt the gauge slightly away from you and push the tool towards the far end in a trailing manner - if you pull, tilt the tool towards you and pull from the far end. Tage Frid refiled the spur half flat and ground a bevel on the other side to eliminate the pin chatter when using it to cut across the grain. 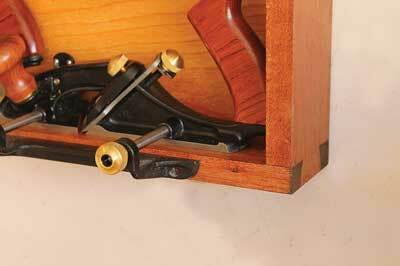 Also called a cutting gauge, a knife gauge slices the wood, leaving a crisp cross line. The knife's bevel should face the waste side; yet, if it is orientated towards the fence, the gauge pulls itself to the workpiece. Making one pass tends to mark a cleaner line than scribing in two heavy strokes. Sometimes, you do need to make a light pass and then make a second, deep layout line to avoid following the grain. You can push or pull the gauge to make a line. The wheel cutter may try to follow the grain when the grain lines approach the reference edge; gauge in the opposite direction. 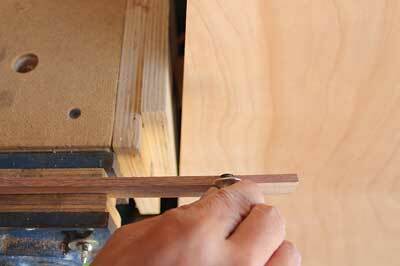 To gauge on the edge of a narrow and thin piece, clamp one end of the stock in a vice first. 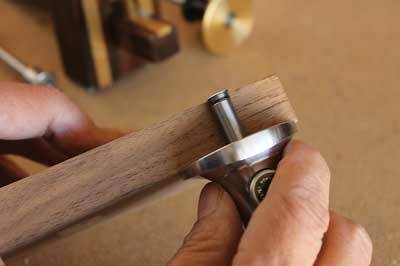 Gauge from one end and, after repositioning the stock in the vice, scribe the remaining line from the other end. To scribe a line on the face of a thin workpiece, place the stock on the workbench with the reference side flush with the edge of the bench, providing more registration surface for the fence of the gauge. that end grains are not kind to a blade. Finally, all the layout marks or lines and surface bruises were cleaned up without extra effort. So, which approach is best? The December issue is now available!